When you are at home trying to relax or in the office doing lots of paperwork at your desk, you sure do not want to sit down in a hard chair or an uncomfortable seat. Recliner seats are one of the best inventions which has been designed to provide ultimate comfort while you are seated. When searching for a recliner or any furniture for that matter, you would normally consider the size and the color of the item. While recliner seats do not usually have colorful finishes, some would consider choosing the color that would fit the theme of their living room or office area. Size is also an important factor since most recliners are bulky, so you have to consider if it will fit the space just right. Apart from these, your budget, the materials used, and the features that they come with are also your deciding factors. Homall Direct is a company that directly deals with manufacturers and sells only the best products straight to you at the lowest prices. 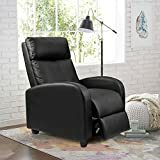 They are among the companies to be trusted if you are looking for a recliner chair for your bedroom, living room, office, or any other space that you see fit. With that said, we are going to discuss one of the best products they offer; the Homall Single Recliner Chair. Read on to find out how this item fares. Warranty Policy:free exchange for installation problems, damage and missing parts within1 year. We are glad to exchange your replacement or refund your money if you don't like the chair your purchase within 1 month. This recliner chair is made up of high-quality PU leather which can be easily cleaned and is comfortable to the skin. It has high-density thicker sponge which has high permeability and high resilience. The footrest of this recliner chair has a thick foam padding with a highly-durable steel frame. It is also retractable and has easy-to-adjust modes to meet your needs and requirements conveniently. It is a push-back recliner with an adjustable footrest, large seat cushion, curved and wide armrests, and a thick recliner back. It can hold a maximum weight of 265 pounds. The seat has a height of 17.7 inches, a width of 19.7 inches, and a depth of 22.1 inches. The back measures 20.9 inches wide and 29.1 inches tall. When opened, this recliner measures 27.6 inches wide, 64.2 inches deep, and 27.9 inches tall. When closed, its dimensions are 27.6 inches wide, 35.8 inches deep, and 38.6 inches tall. It has thick padded back and seat for ultimate comfort. It has double thick padded footrest to allow your foot to rest, pun intended. Its modes are easy to adjust to meet your needs and requirements conveniently. It comes with no-mar rubber feet to protect your floor. It has perfect dual stitching which makes it look elegant. You may feel that your head is getting pushed forward when sitting down. It is completely manual, not electric-powered. The Homall Single Recliner Chair is made up of high-quality PU leather which is comfortable to the skin and can be easily cleaned. It has high resilience and permeability levels due to its high-density thick sponge. It is a push-back recliner which provides ultimate comfort with its large-sized seat cushion, adjustable and retractable footrest, wide armrests, and a thick recliner back. It also has a double thick padded footrest and thick padded back and seat for ultimate comfort. It can hold a maximum weight of 265 pounds, and it measures just about right to fit your space. You can also easily navigate its modes to meet your needs and requirements conveniently. Your hardwood floor can also be protected with its no-mar rubber feet. The material’s dual stitching provides an elegant design and also ensures its durability. Apart from the Homall Single Recliner, some chairs also offer almost the same features, and they are also popular on the market. Let’s see what they’ve got! This chair is an upholstered recliner in microfiber fabric with a laid-back design. It has a high back seat which provides comfort for the smallest to the tallest body structure. It is slim compared to the typical recliners nowadays, but it is a combination of a relaxed, classic style and supreme comfort. It offers three functional positions, and it has a smooth pushback reclining mechanism allowing you to navigate it with convenience. This leather recliner has a classy traditional style which is made up of durable bonded leather upholstery. It provides ultimate comfort while allowing a full-recline position. It has a wider design compared to other recliners and has overstuffed padded armrests and seat to help alleviate pain and provide comfort. It is also designed to withstand long periods of use. After a detailed review about the features, highlights, and minor drawbacks of the Homall Single Recliner Chair and comparing it to other products out on the market, which will you choose as your next piece of furniture? We can say that it is a wise choice for a recliner chair since it is made up of high-quality leather which looks elegant and is also comfortable to the skin. It can provide ultimate comfort because it is large-sized, and it has an adjustable and retractable footrest. It is multifunctional for a very reasonable cost. 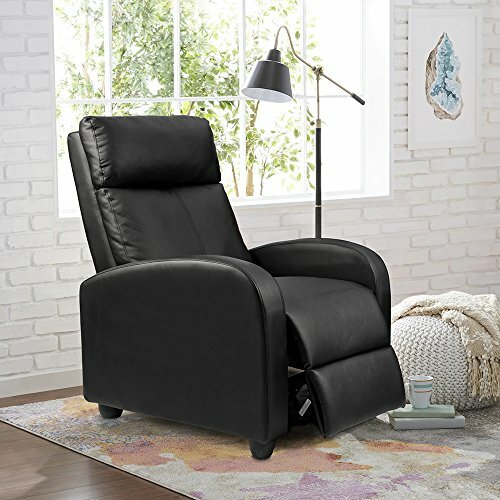 The Bonded Leather Rocker Recliner, on the other hand, is more expensive than the other two products but it is made up of durable bonded leather upholstery and is designed to withstand long periods of use. If these features are the most important to you, then you already have your winner. However, if you prefer fabric over leather, then the Dorel Living Slim Recliner is a better option. It has a high back seat which provides comfort from the smallest to the tallest of body frames, and it is slim compared to other recliners so that it won’t take up too much space. Each recliner on the market is offered for the sole purpose of offering users the ultimate comfort. However, we can agree on one fact that ultimate comfort is rather subjective. Hence, some features are given more attention than the others. And that is what you have to figure out; what feature do you think a recliner should have so that it can give you that ultimate comfort. Some recommended products may use affiliate links. TopChoiceFurnitures.com is a participant in the Amazon Services LLC Associates Program, an affiliate advertising program designed to provide a means for sites to earn advertising fees by advertising and linking to Amazon.com. Amazon and the Amazon logo are trademarks of Amazon.com, Inc or its affiliates. Copyright © 2018 Top Choice Furnitures | All Rights Reserved.